The Monastery of Agios Dionysios celebrates the birth of Ioanni Prodromou on the 24th of June. 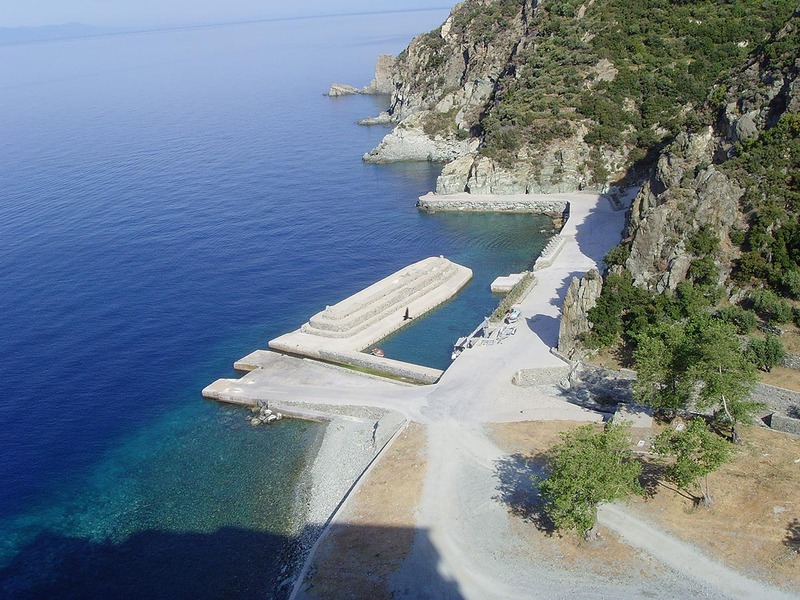 It was founded in 1389 by Agios Dionysios the Koritsa. 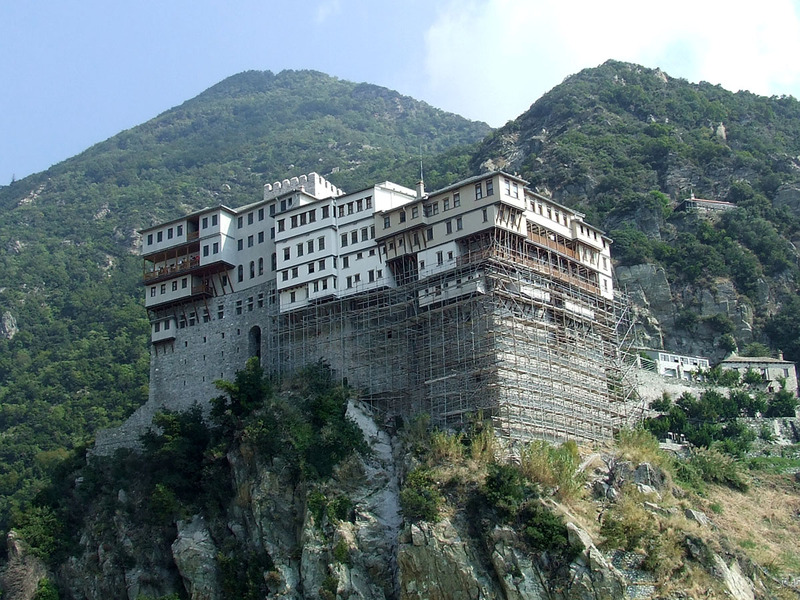 The Monastery is locatedin an altitude of 80 meters, on a rock, and east of the Aeropotamos cascade. It is the 4th in hierarchy among the monasteries of Mount Athos. 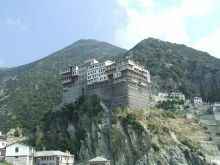 One of the benefactors of the Monastery of Agios Dionysios was the emperor Alexy III Comnenos who besides the fact that he acknowledged the establishment of the Monastery, he also ratified the payment of an amount for the building and he appointed a significant annual subsidy for renaming the Monastery to Monastery of the Great Comnenos. Among the most important benefactors of the Monastery are the emperors Ioannis Paleologos and Konstantinos Paleologos who after the destruction of Constantinople suddenly stopped sending subsidies but they gave their place to the sovereigns of Wallachia and Moldova, Padoul and Neagu (1512-1521), who supplied the necessary resources for the construction of the defensive wall and the aqueduct. In October 1535 the monastery was burned almost entirely outside the tower and it was erected in 1547. 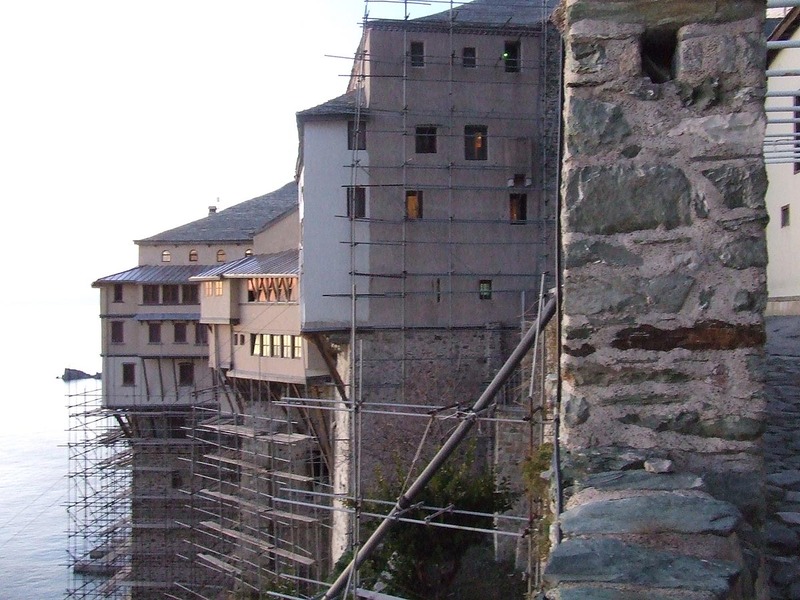 Several sovereigns and non-sovereigns helped to its construction, such as rulers of Wallachia and Moldova (reconstruction of east wing of the monastery), the Large Duke Petros IV (foundations of the Katholikon), the Duke Alexandros IV (reconstruction of the Prothesis in 1568), the brothers Lazaros and Boris from Pijavica (the area which extends to the gardens). The monastery owns 7 chapels within and 8 outside. The Katholikon features murals of the 16th century by the painter Georgy of the Cretan School and it is dedicated to the birth of Ioannis Prodromos (24th June). After the fire in 1535, it was built in 1537-1547. 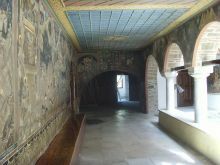 The murals of the narthex are of a later date and were painted by a Romanian painter. The iconostasis is entirely coated with leaves of pure gold and on it you can see the most important pictures of the Monastery, between them and five of Megalis Deisis, works of the famous Cretan painter Efrosynos (1542). Between the Katholikon and the Prothesis an arcade with murals is formed which depict scenes from the Apocalypse. A gate with embossed representations of mythical animals leads to the Prothesis. 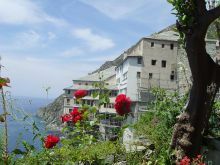 The library has approximately 1100 manuscripts, 27 scrolls, 126 handwritten codes on parchment, 11 handwritten codes in silk, 661 handwritten codes in paper, 45 incunabula and old prints, 5,000 printed books and several dictionaries of the 16th century. 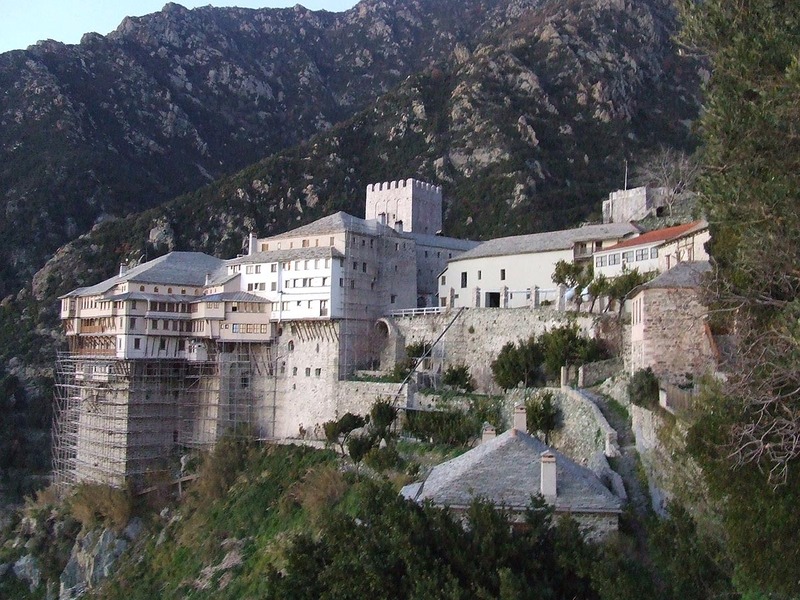 Yet there is the excellent golden seal of Alexios in miniature which ratifies the establishment of the Monastery, the 4 Gospels of the 13th century dressed with carved wooden covers. The relics of the Monastery of Agios Dionysios also feature the silver golden case of the remains of the Patriarch Nifona of Peloponnisos, the right hand of Agios Ioannis the Baptist, of Agios Ioannis Eleimonos, of the Evangelist Loukas etc. Among the sacred relics is a piece of the steel chain that Apostle Peter was fastened with when he was imprisoned in Rome. The greatest holy picture of the monastery is that of Virgin Mary the Akathistos located in the chapel of Akathistos and it is assigned to Evangelist Loukas. 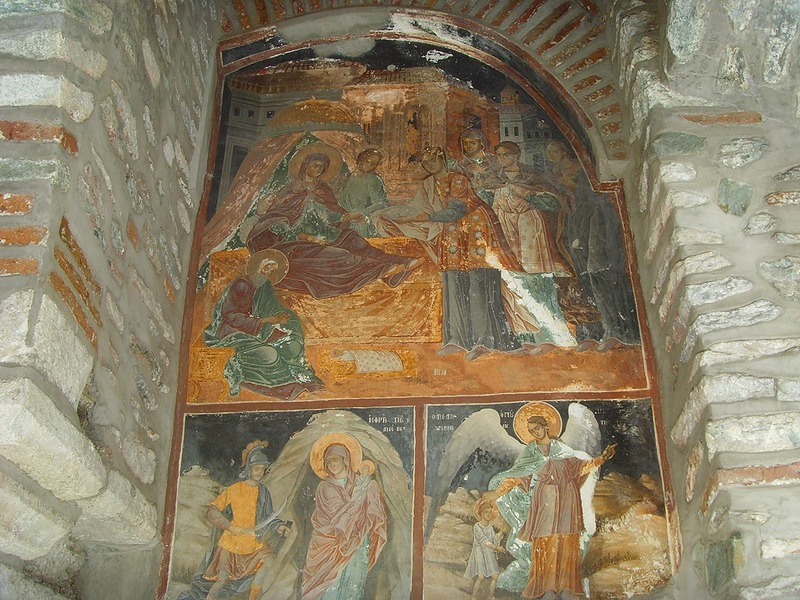 The picture of Virgin Mary the Akathistos is located in the chapel of Akathistos and it is assigned to Evangelist Loukas. During the siege of Constantinople by the Avars in 626, the patriarch Sergios carried the picture around the walls pointing it to the people under siege in order to encourage them. Then one of the biggest miracles and supernatural events of faith happened. The enemies frightened listened to a noise as if thousands of army attacked against them. Suddenly and unexpectedly from pursuers they became persecuted. The historic tradition speaks for an inexplicable grand noise and a tornado which brought mayhem and destruction. 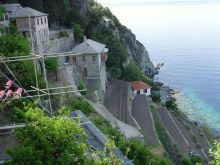 Then the Patriarch Sergios walked with the clergy and the people toward the Panagia of Vlachernon. There within the temple but also outside, the Patriarch began singing for the first time the 'To Thee, the Champion Leader...'. The Akathist Hymn, is chanted today daily in front in the picture.